After dealing with several films from the Silver/DMX/Andrej Bartkowiak disasters, and hearing about how fans were a bit miffed that all of those films had him inexplicably dangling from wires and computer effects for no damn reason, Jet came up with an idea for a martial arts film that would allow him to get back to basics, and Luc Besson (The Fifth Element, La Femme Nikita) took his idea and wrote a script, hired one of his cohorts and produced, and thus came Kiss of the Dragon. The film opens as Jian (Li) a chinese secret agent, finds himself in Paris, France to help the police capture a dangerous chinese arms dealer who is waiting in a posh hotel room for his contact. Jian’s contact in France is a police chief simply named Richard played smarmily (is that even a word? )well by Tcheky Karyo. Soon Jian finds that nothing is what it seems when Richard kills the arms dealer and tries to frame Jian, who is able to escape with a video tape implicating Richard in a fantastic scene that mixes practical stuntwork and some good fight scenes courtesy of Corey Yuen. The fights in the laundry room alone is better than any of Jet’s other American film fights combined. After he escapes he makes his way to a shop that sells rice chips, but is really a front for Jian’s contact in Paris. He heads there to figure out what to do next. Meanwhile, Jessica, one of the prostitutes who went to see the arms dealer, turns out to be Richard’s woman, so to speak, because he’s holding her daughter hostage so he can make some money whoring her out. Yep, nice guy, isn’t he? So her pimp dumps her on prostitute row-just where the shop Jian’s staying in is located. Jian goes to meet the assistant to the Chinese Ambassador, who also happens to know Jian and has some idea of the trouble he’s really in. They meet on a restaurant boat only to be ambushed by Richard’s men in an attempt to get the tape back. They kill the assistant, and Jian attempts to escape in once again another great fight scene, in the kitchen below all the way to the glass roof above. Welcome back to good films, Jet! CHOREOGRAPHY: (9) Well, look at that, someone finally woke Corey Yuen up and told him to choreograph, dammit! The fights are great across the board, and build up just as they should, and the final fight with Cyril Rafaelli is what we were wanting to get from Russell Wong and Mark Dacascos in Jet’s previous films, and we got cheated, but not here! Bravo, Corey! STUNTS: (8) The stuntmen did a really good job here, and sold all of their scenes, and they were game for more complex fighting. STAR POWER: (8) Jet finally looks like the Jet we know from films like High Risk and Once Upon A Time in China, and Cyril Raffaelli really caught the public’s attention in his short scenes and fantastic end fight with Jet. Tcheky Karyo is great as usual, and Bridgette Fonda did a fairly good job. I agree with your assessment here (although, just to split hairs, I would say that Fonda was excellent as opposed to “fairly good” and I don’t think her character slowed the film down at all). But you are right – this is a much better film the the US horrors and I enjoy watching it enormously. The choreography (and the way it is shot and edited) is great. I particularly like the fight scene in the police dojo with the sticks. Great write-up. 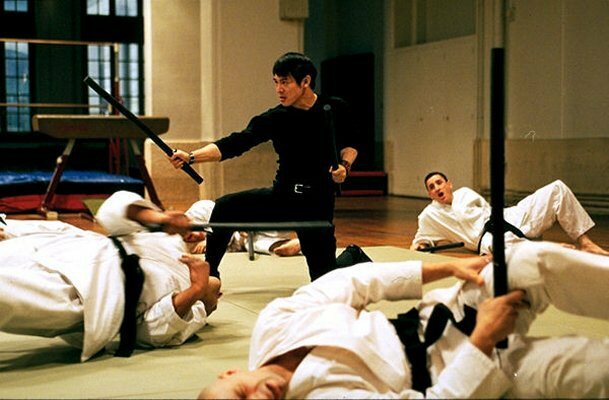 This definitely one of Jet Li’s best. The action scenes are excellent. Never heard of Films of Fury but I’ll be checking into it. Thanks for the link!